The continued growth of online sales has had a notable impact on the traditional retail market. The store chain Sears was once one of the most well-known retail brands in America. But an inability to adapt to the modern market has left them in decline with stores closing every year. For a larger business once they are in a decline cycle it can be very difficult to recover. Smaller businesses often do not survive at all in the UK, for example, high streets have been decimated. Many businesses and brands fail simply because they don’t know how to address the modern marketplace and because of that they don’t understand what strengths traditional retail still has and how to leverage it. Retailers and brands are both working simultaneously (and often independently) trying to reach customers while competing with e-commerce. Here are several key strategies to help your brand and retail business complete with online sales. Modern online shopping technology can be used by traditional retail stores as well. For example, make use of your OMNIChannel if a customer buys an item online offer local store pickup and they may buy other things once they're in the store. The reverse also works if you are out of stock in store an item may still be available online. You can facilitate this via endless aisle to complete the purchase in store. QR codes can be implemented to complete sales or provide more information to consumers. An advantage of online shopping is the sheer selection. This is also a disadvantage as well. For many shoppers the option choices are overwhelming and they don’t know what to buy. In a retail environment, you can curate customer selection. Sell a selection of products but not so many that it becomes confusing. You can also place items next to each other that are commonly bought together for a more convenient shopping experience. You can also use your POS displays to highlight discounted items increasing sales and the 'Customer Experience (CX)'. Shopping online is a rather one-sided experience and is entirely on the buyer's side. It doesn’t have the personal touch or salesmanship a retail store has. For example, when buying online many people buy whatever is cheapest or on sale. 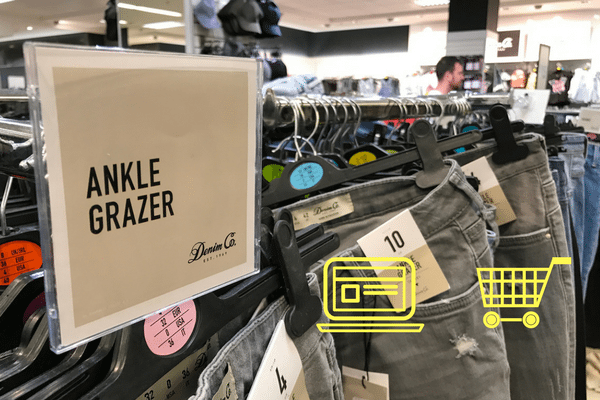 In a store, customers may be drawn to discounted items but by interacting with a sales person or seeing a well placed POS display they can be upsold on purchases they had not yet considered. When you buy something that is a material act and you now own something. Shopping means you are looking for something to buy. Online stores may have a big selection but you cannot touch a good before you buy it or interact with it aside from pictures. In a store, you can touch a shirt, try on shoes, or try out various options on TV. Take advantage of this tactile element by letting customers engage and also talk with them to assist in what they are looking for if they do not know. Create an experience that goes beyond just buying a thing.